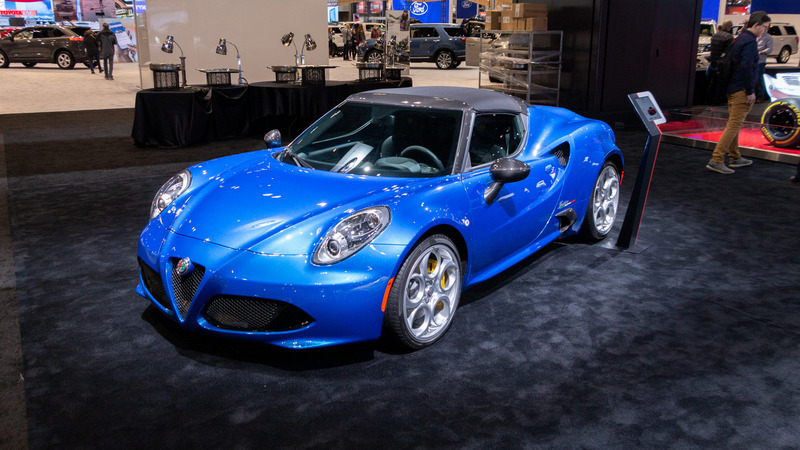 We visited R. Ferri Automotive where a 3M authorized installer covered our 2018 Alfa Romeo Giulia long-term test car with one of the most advanced paint protection films, the Scotchgard Paint Protection Film Pro Series. There’s nothing nicer than parking your new car in your driveway, standing back, and admiring it in all of its gleaming and shiny glory. 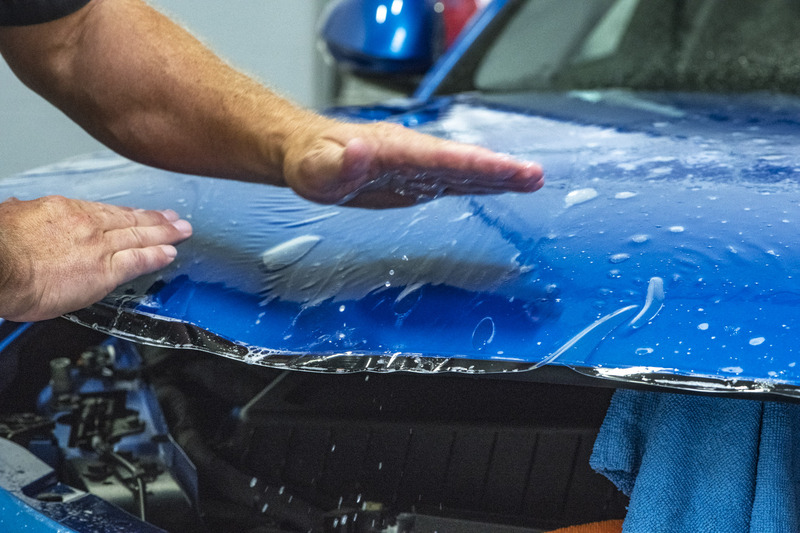 For some of us, though, our next thought is, ‘how do I keep my pride and joy looking shiny and new?’ Whether you have purchased a new or pre-owned car, one of the most effective methods of protecting your vehicle’s paint surface is to cover it with paint protection film. Paint protection film is a clear, strong and thin urethane film. It measures just 6 mils thick, or six-thousandths (0.006) of an inch. To put that in perspective, a human hair is about 1 mil thick, or one-thousandth (0.001) of an inch. Paint protection film protects vulnerable paint surfaces from scratches, stone chips and stains. It also protects painted surfaces from fading because it contains UV inhibitors. Paint protection film was invented in the 1960’s during the Vietnam War. During the war, many U.S. helicopters crashed because debris damaged their rotor blades. 3M worked with the U.S. military to engineer a solution: applying a thin, protective urethane film to the leading edge of rotor blades. In the 1980’s, racing teams started using paint protection film to protect sponsor graphics on their race cars and to help hold the cars together during a crash.3M was the first to introduce paint protection film to the automotive aftermarket in the 1990’s with its Scotchgard product. Other manufacturers now offer paint protect film including Xpel, SunTek and LLumar. 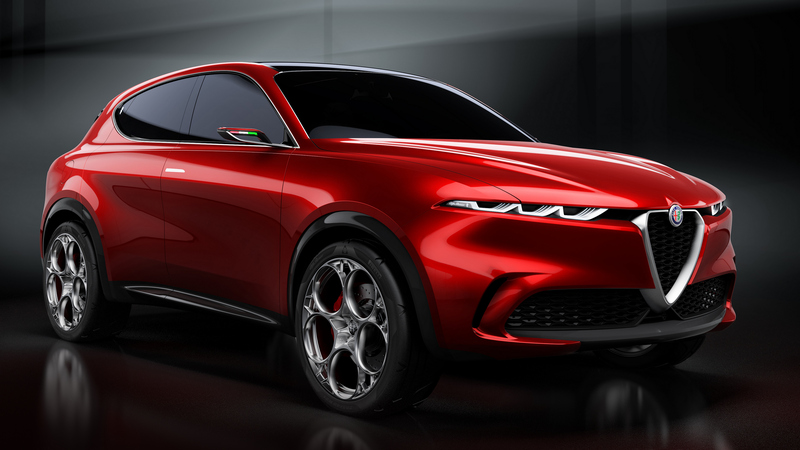 To protect the paint on our 2018 Alfa Romeo Giulia long-term test car, we chose 3M in part because they invented and perfected paint protection film, they introduced it to the motoring public, and they currently offer the longest manufacturer warranty, which is 10 years for the Scotchgard Paint Protection Film Pro Series. The most common application of paint protection film is on the front bumper and hood. You can also cover mirrors and front quarter panels, or, if you are in an extremely protective mood, you can cover your entire car. This is more common for high-end exotic cars and can cost from $3,000 to $10,000, depending on the size of the car. On average, consumers will spend around $800 covering the front of their car in paint protection film. 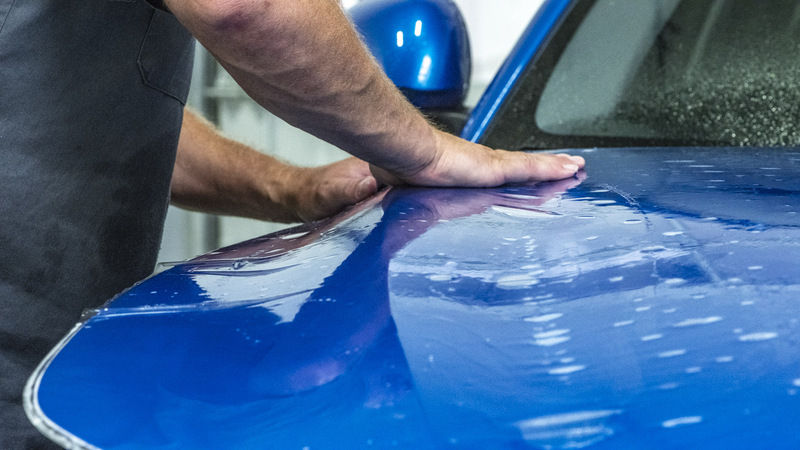 The overall concept of paint protection film is quite straightforward: produce a strong urethane film with adhesive on one side and stick it on a car’s vulnerable paint surface. But, in practical terms, maneuvering huge sheets of extremely thin and sticky film onto a shiny paint surface and applying it perfectly (no air pockets, folds, creases, or other imperfections) is next to impossible for any of us mere mortals. Moreover, manufacturer warranties are only available on installations that have been performed by authorized installers. For these reasons, installation is best left to professional installers. Learning to perfect the paint protection film application process takes years of training and practice. 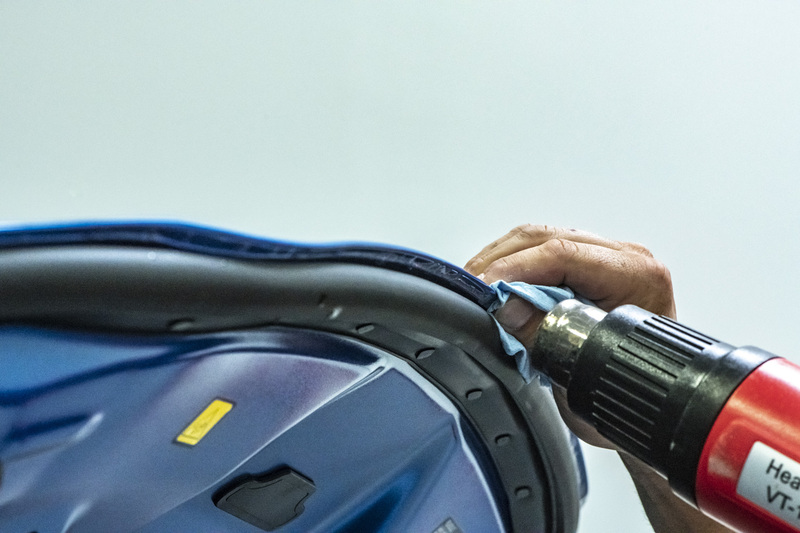 Skilled installers make this incredibly intricate and tricky process look easy.The overall process takes several hours, depending on how many surfaces the installer covers. In our case, we covered the entire hood and the two front fenders. The whole process took about half a day. Paint protection film manufacturers have designed patterns for most new cars on the road. This is no small feat. As you can imagine, some of the patterns are incredibly intricate, especially because you only want to cover the painted surface of your car, not the grill, lights, parking sensors, etc. 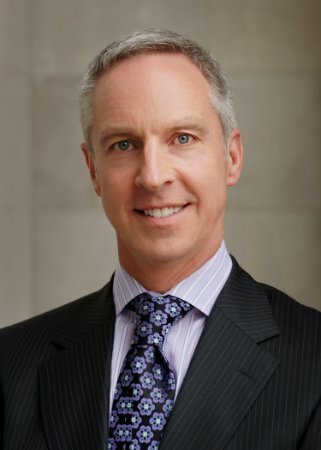 The front of every car model is unique, requiring a pattern that matches each specific model exactly, to the millimeter. To start the process, the installer loads the specific pattern from the pattern library into the digital plotter. With a sufficiently large sheet of paint protection film in the plotter, the digital cutting begins. Out comes the perfectly matching film, ready to apply onto the car’s painted surface. 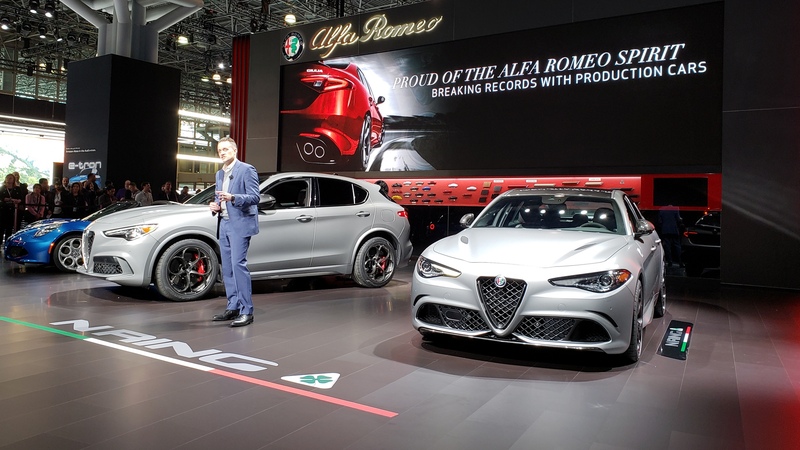 In our case, a 3M authorized installer uses 3M’s proprietary software to cut out the exact shapes of film required for the 2018 Alfa Romeo Giulia. The installer loads Giulia patterns into the plotter, and out comes the paint protection film, ready for installation. The first step in the installation process is to clean thoroughly the paint surface that paint protection film will cover. The installer washes the painted surface to remove all adhesive residue, wax, tree sap, road tar, bugs, and other sediment. It is crucial to start the instillation process on a very clean surface. 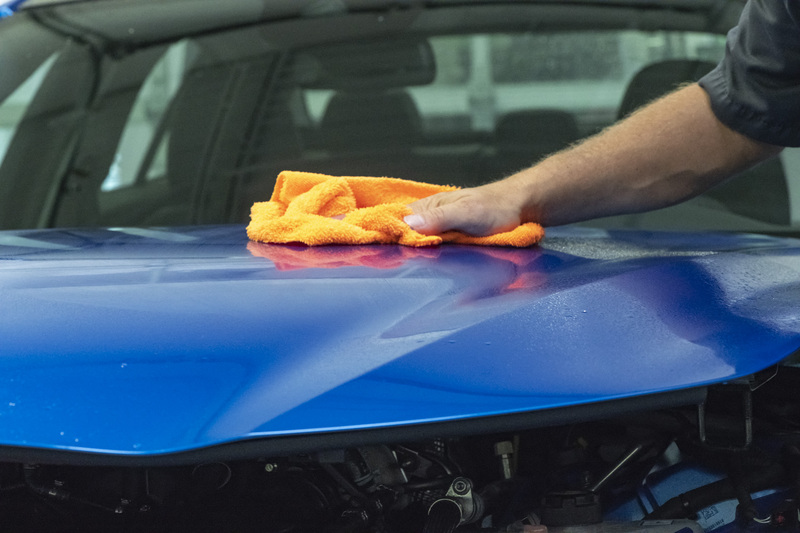 Once the car’s paint surface is clean, the installer sprays his hands, the paint protection film, and the paint surface with a baby soap and water solution, referred to as the ‘slip’ solution. The installer lays the paint protection film adhesive side down on the painted surface. 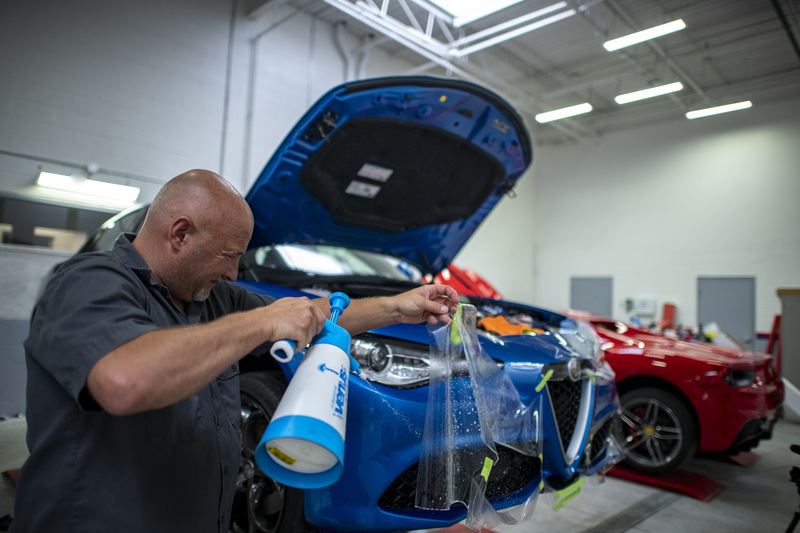 The slip solution lubricates the paint protection film so that it moves easily on the paint surface, enabling the installer to position the film correctly. 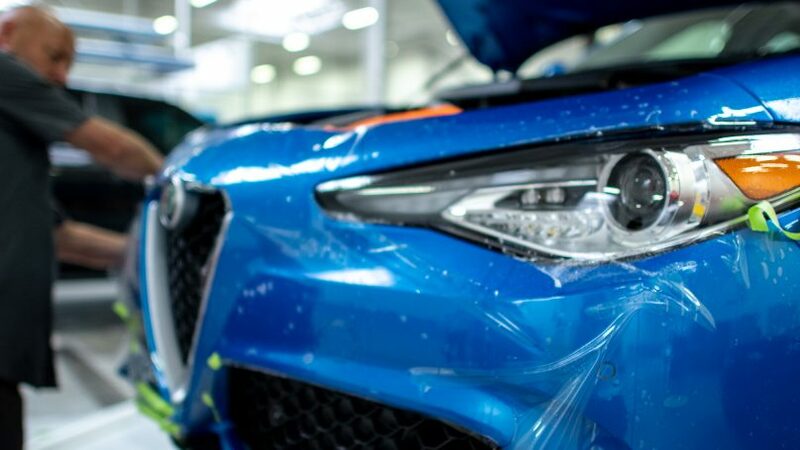 Once the paint protection film is in the correct position, the installer uses a ‘tack’ solution, made of isopropyl alcohol and water, to anchor the film in place. 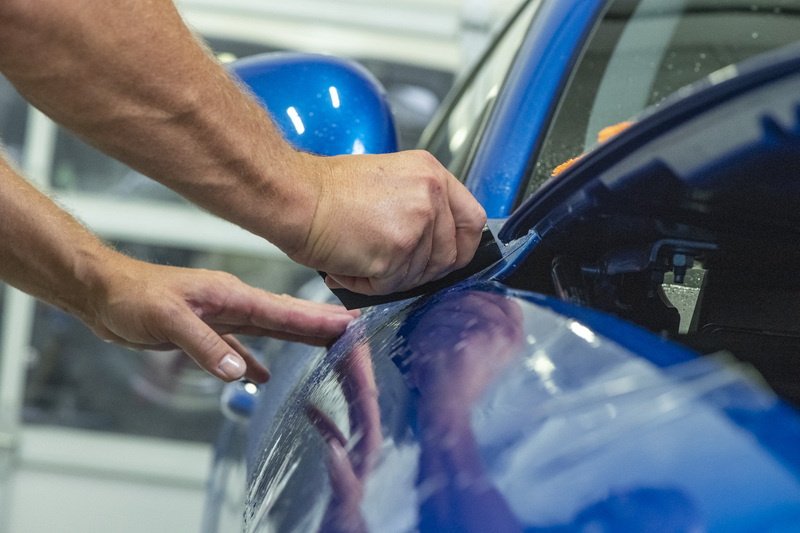 With the paint protection film locked in place, the installer uses an application squeegee to force the liquid and any air bubbles out from between the paint and the paint protection film. This allows the adhesive on the film to bond to the paint surface. The installer may use a heat gun in the final stage to ensure all edges adhere to the painted surface. The installer can also use adhesive primer to make sure the product doesn’t lift under the edges. Generally speaking, paint protection film is maintenance free. Applying Meguiar’s Ultimate Quik Wax Spray and Meguiar’s Ultimate Fast Finish Sealant can provide additional UV protection. These do not contain abrasives and will not leave residue along the edge of the film if, for example, the film covers only half of the hood. 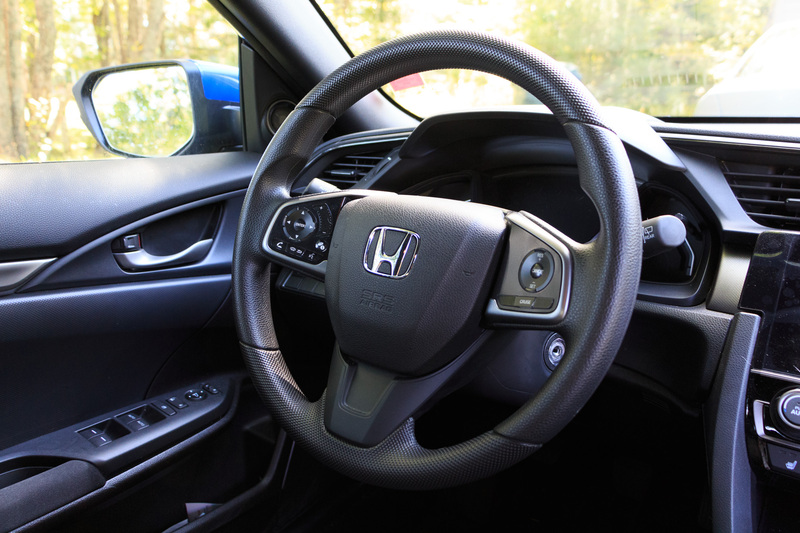 After first installing the film, you should avoid automatic car washes and refrain from waxing for one week, allowing the film to adhere to the paint surface properly. You should also avoid waxes that contain dyes, abrasive polishes or rubbing compounds. Otherwise, you can care for paint protection film just like the paint surface on the rest of the car. Better care of the film will result in longer life and greater effectiveness of the paint protection film. Sounding a little like it is out of a science fiction film, some of the higher end pain protection films, including Scotchgard’s Pro Series, have self-healing technology. Most scratches can heal themselves, and small scratches can disappear. The film’s ‘healing’ usually occurs with the aid of heat, either from the sun on a hot day, or with the help of a hairdryer. It takes a lot of training and practice to learn how to install paint protection film correctly. We cannot imagine what it would be like to attempt to do this ourselves—the results would likely be laughable. For this reason, all of the paint protection film providers recommend using authorized installers. 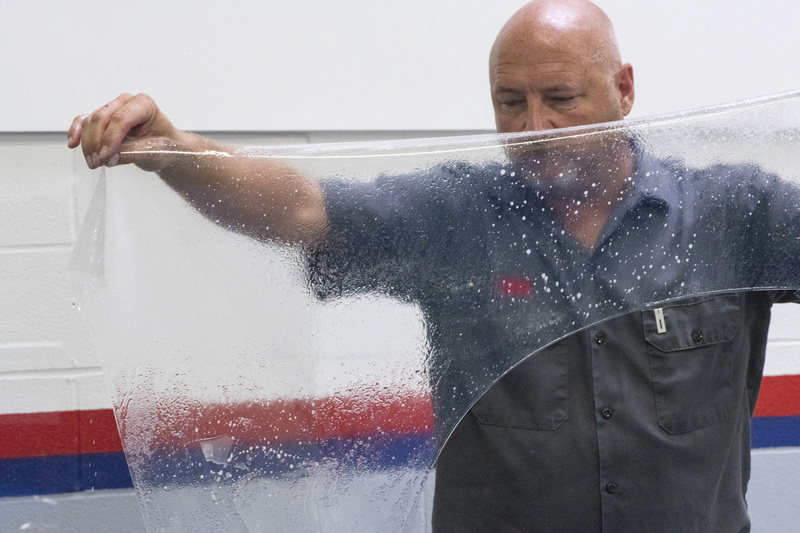 Additionally, eligibility for manufacturer paint protection film warranties, including 3M’s 10 year Pro Series warranty, requires an authorized professional to perform the installation. Authorized installers are located in most major markets across Canada. 3M is the only manufacturer of paint protection film proven to meet automotive Original Equipment Manufacturer (OEM) specifications. 3M’s film is available when ordering vehicles from Toyota, Mazda and Porsche. It is possible to remove paint protection film without damaging the painted surface. Using a steamer or hair dryer to warm the surface can ease the peeling-off process, but doing so is not required. 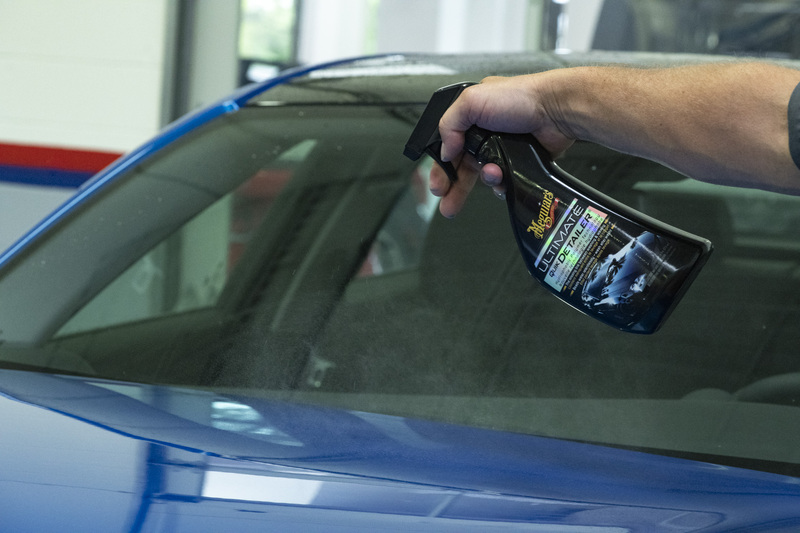 Ideally, an authorized installer should perform the removal of paint protection film. Advertorial content: 3M Canada provided the paint protection film and installation for this particular application. However, the opinions expressed in this article are solely those of TrackWorthy, and the content was not subject to 3M Canada’s approval. PHOTOGRAPHS BY SAM REITMAN. ARTICLE AND VIDEO © COPYRIGHT 2018 TRACKWORTHY GROUP LTD.
Share your paint protection film stories with us in the comments section below, or email us at [email protected].